Quality Vending and Coffee: family-inspired, customer-focused. The early days: Carl, Don, JoBeth and Dean. Like Amazon, Apple and Disney, our business started in a garage. 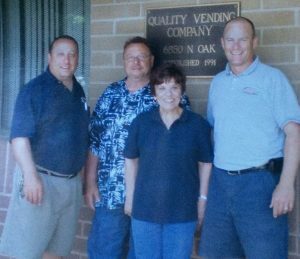 Founder Don Miceli established Quality Vending in 1991 after a successful 30-year career in the vending industry. With his late wife JoBeth, they launched the company from home, with the two-car garage serving as product warehouse, right alongside the family’s washer and dryer. Don’s son Carl was with him from the start, and son-in-law Dean Prather joined shortly thereafter, making this truly a family-inspired endeavor. Together, they built a quality-driven company where, for nearly 30 years, customers have enjoyed courteous and prompt services from a professionally trained vending services team. Today, Carl and Dean lead the state-of-the-art operations from an expansive warehouse space, providing the latest digital technology in vending equipment, barista-quality office coffee, convenient micro markets and office pantry services. As always, our vending services are free to customers – no leases and no equipment to purchase. Product lines include top selling national brands in snacks and beverages, including healthier options. We invite our current as well as prospective customers to tour our facility. 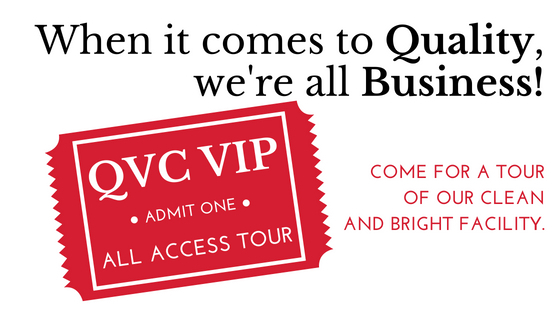 Come and experience our “All Access V.I.P.” tour! Do you care about the quality of your vending snacks and beverages? The quality of our products and our service is a huge source of pride for us. We love hosting our customers in our clean and bright warehouse, and we welcome you any time. Come for a tour and enjoy some snacks and beverages on us! 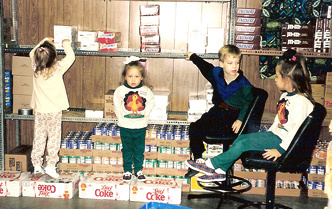 The grandkids in the start-up days when the company was operated from the family's two-car garage. Built with hard work, family pride and values, Quality Vending and Coffee is the vendor of choice for many of the region’s top companies, serving mid-size firms to larger operations such as school districts and manufacturing facilities. Many of the company’s first accounts are still among the businesses and organizations the company is grateful to serve across the Kansas City metro and beyond. Our coffee equipment, along with everything we need – premium coffee, cream, sugar, cups and all the accessories – are conveniently delivered to our offices. It saves our company time and money, and everyone loves the coffee. Our dealership, formerly Frank Ancona Honda, has the distinction as Quality Vending Company’s very first customer of record in 1991. They’ve provided exceptional service and products since day one. 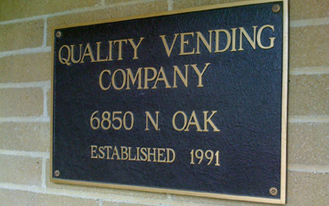 Quality Vending has always surpassed our expectations. The service is reliable and responsive; the snacks and drinks are great; and their people are even better.